You are at:Home»Things to Do»19 Hot Events: Funky Family, Zero Waste Festival, Thanksgiving Buffet, and More! 19 Hot Events: Funky Family, Zero Waste Festival, Thanksgiving Buffet, and More! Aged 4-12 years old. The SYDNEY-GYM Team is a future athlete who wants to learn English while learning to swim in a competitive atmosphere, we set up different courses with different content to meet the various stages of child’s swimming upgrade needs. Courses will be subdivided into eight themes: Strength, flexibility, endurance, balance, reaction speed, coordination, attention. Tue-Fri 10am-8pm. Sat-Sun 9am-6pm. Olympic Sports Center. Contact WeChat/Phone: 18610811988 or click here for more information. Above 3 years and family. This 90-minute performance is based on a fantasy novel for children by C.S. Lewis. There will be two performances on Nov 26: 1-3pm and 6-8pm. 600 seats are available, which will be reserved by ticket number on a first-come-first-served basis. RMB 100 per person (tickets required for both adults and children). The tickets can be picked up at Renee International Arts Center after purchasing. All tickets are non-refundable but could be transferred to others. The Theater of International School of Beijing. All ages. Get ready to spend some good air days inside Feast, having a lazy lunch with mommy friends while the kids play in their new playroom. Order your main course a la carte, and check out the buffet for salads, cold cuts, and delicious starters. Kids under 6 eat free, and 7 to 12 year olds pay half price. The kids’ room is kitted out with bouncy horses, tents, dolls, rides, giant teddy bears and many more fun toys. 5.30-9pm. Price: RMB 145 per person. For reservation, call 8414 9820. All ages. Carols for a Cause: Riviera Xmas Market, a charity fair and holiday market will take place at the East Lake Garden with activities like carol singing for both kids and adults. There will be booths where our young merrymakers can play bubble football, do rock climbing and horse riding, and even make their very own gingerbread house, as well as vendors selling essentials like mulled wine, Christmas cookies and chocolates, German stollen (fruit loaf), and punch. Free. 11am-4pm. For more info, add Julia on WeChat (ID: chenshihhan). All ages. 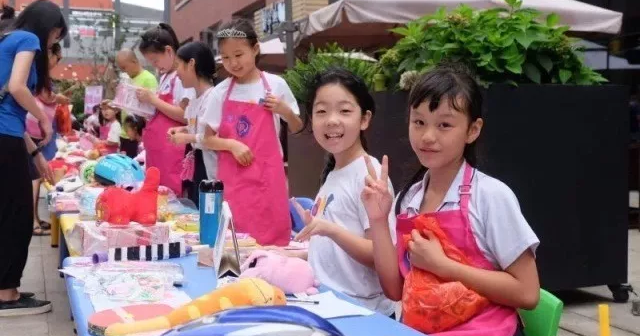 Presented by Beijing’s leading sustainable lifestyle brand Farm to Neighbors, Zero Waste Festival will not only feature zero waste market, panel discussion, workshops, exhibition and charity raffle, there will also be a useful Recycle Station, which will help you alleviate waste from your homes and transform them into useful objects instead of going to landfill. Noon-6pm. The Grand Summit. Contact WeChat Farmtoneighbors for more information. Grade 2-5. Come learn with WAB! Parents will participate in a workshop on learning at WAB led by their Elementary School principal, assistant principal, and IB PYP coordinator. Your children will have the option to join in fun WAB activities or real classroom experiences during the open house. A tour of their stunning campus led by admissions officers and WAB parent ambassadors will be offered to both parents and their children. 8.45-11.30am. Lotus Lounge. Check out the website to book your reservation. For a complete schedule or more information, please contact admissions@wab.edu. Adults. Join Carnisa Berry, Relationship Life Coach as she leads you on a journey of self-discovery through emotional awareness: Stop the negative self-talk; Identify, and understand you; Trust your inner voice. RMB 250 / RMB 300 at the door, workbook and light refreshments included. Contact Carnisa via WeChat (BerryThoughtfulLife) or Email (carnisa@berrythoughtfullife.com). Sunny Dental.